16-year old Dakota Brown used to love all things horse - until her brother, mother an father died and she was moved into foster care. Dakota is a runaway. She has run away from 7 foster homes and, from the moment she sets foot on her new foster parents farm, Starlight Animal Rescue, she plans her escape. But can an impossible horse named Blackfire and this quirky collection of animal lover be the family she's always dreamed of? 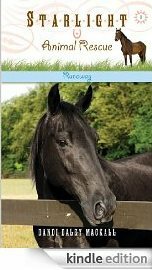 Runaway is the first book in the 4 book series 'Starlight Animal Rescue' written by Dandi Daley Mackall, author of the bestselling 'Winnie the Horse Gentler" series. This is my favorite book by a LONG way! I just love it! Please read it everyone!!! These books are AMAZING! I am 13 and still loved them! This book is part of the Starlight Animal Rescue series. This series is by the amazing author of WINNIE THE HORSE GENTLER! It is a great book has tips on adopting animals too. This book is by the same author of winnie the horse gemtler. it the first book i would recommend any one to read it. Going on my list to read and review. Thanks for telling us about it!